Ma l’amor mio non muore! 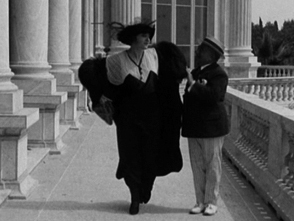 | Love Everlasting (IT 1913) | Silents, Please! Lyda prima diva! What better place to begin Diva December than the film that started it all: Ma l’amor mio non muore! 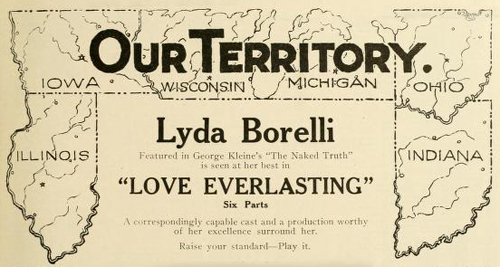 | Love Everlasting (IT 1913), starring the inimitable Lyda Borelli. Ma l’amor mio tells the story of Elsa Holbein, the daughter of a Colonel in service to the Grand Duke of Wallenstein. 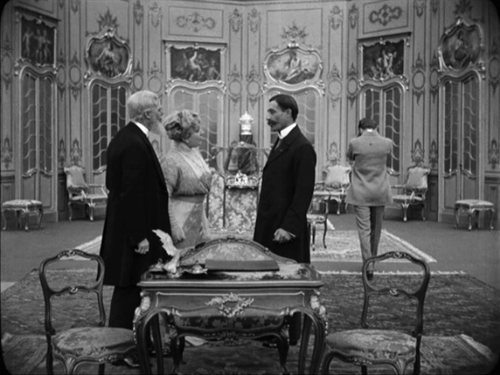 At the opening of the film, she and her father are living in comfort, receiving guests in their grand home. Enter Moise Sthar: spy! The secret agent works his charms. He steals military documents from the Colonel, and in despair over the resulting accusation of treason, the Colonel shoots himself. Also disgraced, Elsa is exiled to Switzerland. It is unclear to me whether they thought she too was culpable in the theft, or whether she was simply tainted by association. One thing is sure: the diva’s trials have begun, and the stage is set for drama. One of the lavish, expansive interior sets. This all takes place over the first couple of acts of the film, which are relatively slow – this section is generally told in lengthy shots where the action is staged in deep space. It’s skilfully done, and the sets are lovely, but on the whole the setup drags a bit. This part of the story is drawn out more than necessary, in my opinion, but the filmmakers also make a more serious error: filling the screen with a large amount of actors who are not Lyda Borelli. Luckily, the filmmakers seem to have realized this, and the camera thereafter consistently finds its rightful view: the dramatic grace of la divina Lyda. Lyda Borelli as painted by Cesare Tallone, 1911. Perhaps slightly overcooked, and yet effective, distinctive. In Switzerland, Elsa christens herself Diana Cadouleur (symbolic naming alert: douleur being French for ‘pain’) and reinvents herself as a singer and actor. 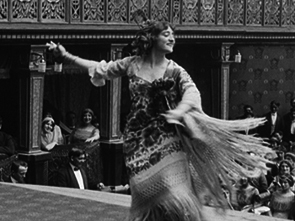 We see her on stage, performing Zazà and Salome. These roles are deliberate recreations of Borelli’s most prominent real-life stage successes, and one wonders if it was at her behest or the screenwriters that they were chosen. As it turns out, there is a (somewhat) valid reason for his concern: he is in fact Prince Maximilian, heir to the duchy from whose society she has been cast out (unbeknownst to him). When she finds out his identity, she decides to leave him; composes a letter, heartbroken. But the two will meet again. In one of the more interestingly framed shots in Ma l’amor mio, Maximilian watches Diana perform, as if on a screen. And then comes a moment of unintentional comedy that I can’t believe they didn’t retake. I’m sure it was meant to be a dramatic cascade, but what happens is this: Maximilian, visibly perturbed and struggling with the sudden dead weight of Lyda, just drops her. Lyda falls on to the chaise longue, fanning out her arms as her head bounces off the ground. I didn’t capture the head bounce, but you can imagine it. A more fitting ending is provided by this oval vignetted shot. 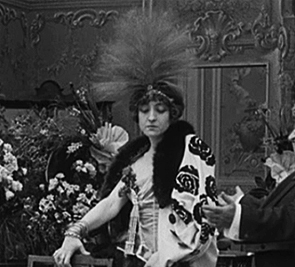 Borelli appears as one of the first actresses to understand the importance of the effect of the body and the face on the screen. She knew how to show her long delicate fingers, her marble-like shoulders, her long neck twisted towards the spectator in a Mannerist fashion, her Beardsley-like profile, her forehead lifted proudly while her eyes were half-closed with melancholy. […] Her artificial language of gestures and poses, like the hand under the chin for the melancholy pose or at the forehead expressing thought or despair, became one of the ingredients of a style in acting named after her, Borellismo. The diva always insists on her own physicality, commands the eye. Interestingly, even American adverts also made special mention of Lyda’s poses. The Motion Picture News, 24 Jan 2014. Mirrors recur often in diva films, as they do cinema in general. It is a well-worn motif in the visual arts: the mirror distances and objectifies, but also reveals truth, and is often connected to the sin of vanitas (vanity). The mirror can imply a surplus or excess of self, different identities, an internal conflict. And of course, from an aesthetic point of view appealing compositions or effects can be obtained. In short, mirrors can function as an expressive and functional device in a number of ways. It’s already notable from the shots above what a prominent role Lyda/Elsa/Diana’s triptych mirror plays in the film. Kisses and gestures are echoed in it, actions are revealed, and Lyda and her beauty multiply, inviting the audience to consider Borelli the diva, Elsa the exile, Diana the actress. 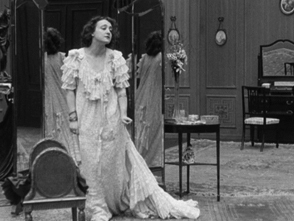 In early scenes, the mirror is used cleverly to put Lyda in centre stage while revealing her suite of admirers approaching. Likewise, before her final performance, it’s through the mirror that Lyda initially perceives Maximilian’s entrance. Indeed, one could almost consider the mirror to be the main co-star of Ma l’amor mio non muore. I spent some time pondering how to write about diva films. Normal rubrics don’t necessarily apply; what are the essential elements by which one could evaluate films of this kind? Besides those already discussed, here are some other parameters essential to the success of a diva film. An intertitle tells us that Diana is sad and lonely; cut to a shot of her surrounded by a bevy of admirers, apparently enjoying herself. The resemblance between Colonel Holbein and Slovenian theorist/provocateur Slavoj Žižek. Multiple male actors sport conspicuously fake beards and sideburns; presumably the costume budget was already used up on Lyda’s dresses. The breeze of Italy is clearly, charmingly visible in the indoor sets. Moving Picture World, 31 Oct 1914. 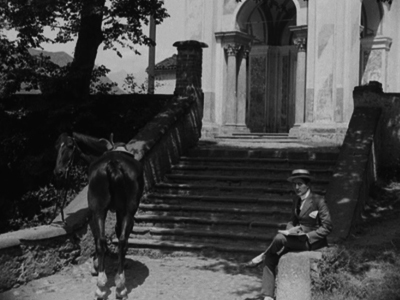 According to Angela Dalle Vacche in her chapter in Italian Silent Cinema: A Reader, diva-films sold well abroad – she cites Latin America, Russia, Japan, the Balkans, Egypt and Spain as export markets. I have seen advertisements for diva films in American trade journals, but not much about their reception stateside; the acting styles and slower editing may have been less appealing to the American public than the homegrown product, particularly given the import time-lag. Therefore, whether Ma l’amor mio made a splash with the people of Illinois, Iowa, Wisconsin, Michigan, Ohio and Indiana is an open question. 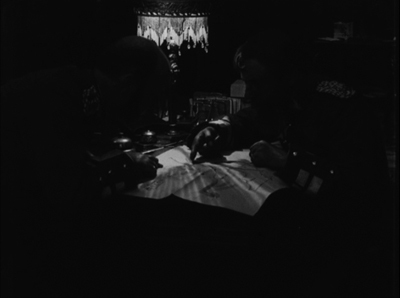 It is somewhat strange given that the same scene of the generals is also shown in long shot under normal indoor lighting conditions, but indeed it’s striking. Also, in the American/English language edition, the spy is called Leslie Swayne, and Lyda’s stage name is Marjorie Manners. Haha! Almost all cultural products (of every type, from opera to cooking) can be placed on a scale of values. Halfway on the scale are the medium works, above the diamond-studded tiara of masterpieces, below the pit of rubbish. Love Everlasting is considered to be a diva film. 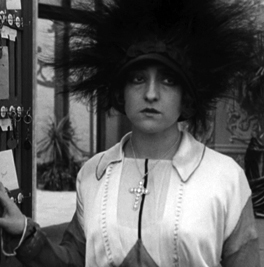 We can also look at it as a documentary on how the actress Borelli, on her first attempt, knew how to use the cinema and the camera to explore her own expressive art to the limit, in an experimental way. A documentary that comes to us from a past where the words art and actress rang with major significance. Ma l’amor mio non muore! [Love Everlasting]. Dir. Mario Caserini. 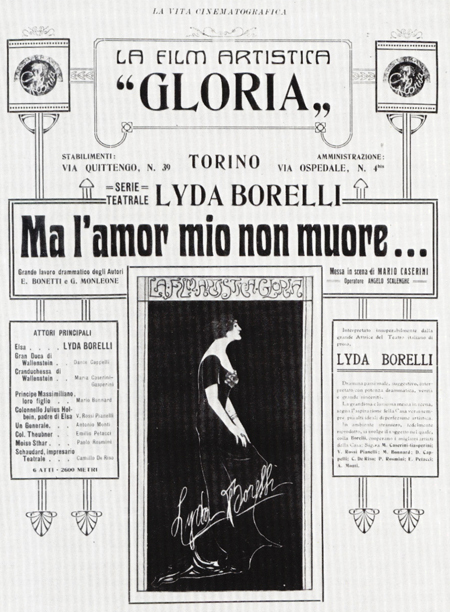 Turin, Italy: Gloria-Film, 1913. Available on DVD from the Cineteca di Bologna. 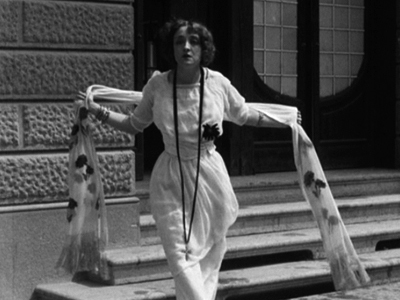 This entry was posted in Film and tagged cinema of 1913, cinema of Italy, clothing & fashion, diva films, Evlaliya Kadmina, Lyda Borelli, Mario Caserini. Bookmark the permalink.